Previously hosted as part of Music Education Week in Washington, Drum Corps International will present its Marching Music Academy this August as part of the World Championships in Indianapolis. The Marching Music Academy was created in 2010 to help support music educators in their initial, formative and advanced stages of marching music programming at their schools. "The program is designed to support all band directors, regardless of the size and scope of their programs, with sessions of interest to the first year teacher as well seasoned veterans," said DCI's John Phillips. Phillips, who has headed the Academy since its inception, outside of his work in the drum corps activity has been responsible for developing the arts curriculum for the province of Ontario and has taught undergraduate music education courses at the University of Toronto and York University. The two-day program runs from Friday, Aug. 10 to Saturday, Aug. 11, with a variety of interactive sessions scheduled that focus on program design, music arranging and visual design, music and marching technique, and health and safety practices. Conferences will be led by a number of well-known and well-respected teachers and clinicians in the world of marching music both local to Indianapolis and from across the country. "The Academy's curriculum content, which connects to the National Association for Music Education's Marching Music Guidelines, will provide participants with a 360 degree perspective of the marching music experience through the lens of DCI," Phillips said. "It will be a great way for band directors of all levels to prepare for the fall marching music season." Marching Music Academy registration is $149, which covers the cost of all materials, two meals, refreshments and a premium ticket to the DCI World Championship Finals. NEW FOR 2012: Drum Corps International will partner with Chicago's VanderCook College of Music to offer graduate credit to those attending the event and completing the requirements of the course. A separate $250 course fee will be accepted through VanderCook. Additionally, Remo, Inc. is offering a $100 scholarship for those who register, reducing the tuition to just $150. 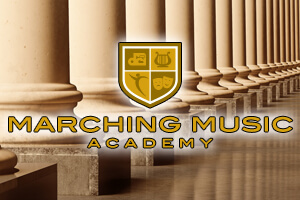 Learn more about the Marching Music Academy and register today!